Prior to founding ASCENDANT, Chris Roberts was Chairman and CEO of Digital Anvil (DA), the game development and digital effects company he founded. DA became the first interactive entertainment company to make a game title, WING COMMANDER, into a $25 million feature film. DA also became a digital effects powerhouse, creating all of the digital effects for the WING COMMANDER movie and contributing to the digital effects for several other films, including SPY KIDS. In December 2000, Roberts sold DA to Microsoft. A gaming wunderkind, Roberts sold his first computer game at the age of 14, and by the age of 20, Roberts had developed three #1 hits in his native U.K. 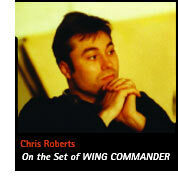 In 1990, Roberts developed WING COMMANDER, which set a new standard for PC games and evolved into a franchise series of game titles, all developed and produced by Roberts. With its cinematic quality, clearly developed storylines and well-know actors, the WING COMMANDER series created a whole new genre within the gaming industry known as the interactive movie. In addition to selling more than 3 million units worldwide by 1995, the WING COMMANDER series won a record setting number of gaming awards. To date, the series has generated over $400 million in global retail revenue. Before joining ASCENDANT, Schimmel was Executive Vice President of Production for Bel-Air Entertainment where he CO-producedCOLLATERAL DAMAGE starring Arnold Schwarzenegger. While at Bel-Air, Schimmel also supervised the productions of SWEET NOVEMBER starring Charlize Theron and Keanu Reeves; THE REPLACEMENTS starring Keanu Reeves and Gene Hackman; and the wrestling comedy, READY TO RUMBLE. Prior to his employment with Bel-Air, Schimmel was President of Michael Douglass Universal-based Further Films, which he helped Michael establish. Schimmel came to Further from Paramount-based Douglas/Reuther Productions, a venture between partners Michael Douglas and producer Steve Reuther. 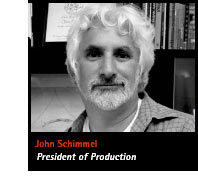 Schimmel served as Senior Vice President of Production for Douglas/Reuther Productions, where he supervised the production of John Woos FACE/OFF and post-production of Francis Coppolas THE RAINMAKER. Schimmel began his film career as a reader and soon became a production executive at Warner Bros. There he worked on such films as THE FUGITIVE, OUTBREAK, UNDER SIEGE, BATMAN, THE LAST BOY SCOUT and INTERVIEW WITH THE VAMPIRE. He also did all of the early planning, hiring and buying for Warner Feature Animation. information to be posted soon - check back for updates.